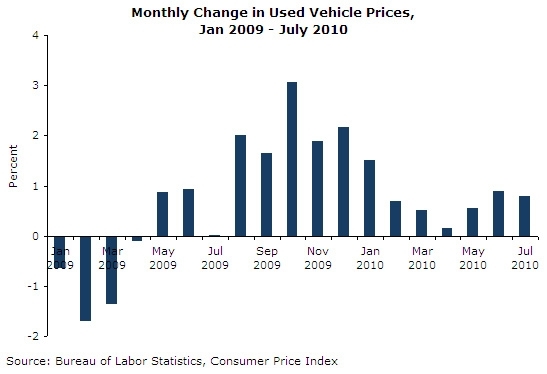 The price of used vehicles decelerated slightly from a 0.9 percent rise in June to 0.8 percent in July. The 9.3 percent annualized rate of inflation over the last three months—while still high—is far below the 32.5 percent rate over the fourth quarter of 2009, when that summer's cash-for-clunkers program had drained the supply of used cars on the market. Read the entire Prices Byte.